From its earliest beginnings as a ragged outpost of the Dutch commercial empire, New York was a city driven by global commerce. Trading voyages began immediately after Henry Hudson’s voyage of discovery in 1609, initially backed by Dutch private investors and later controlled by the Dutch West India Company. When the company abandoned its monopoly on the fur trade, private investment once again flowed into the colony, making the city of New Amsterdam a hub of Atlantic trade that linked Europe, Africa, South and Central America, the Caribbean, and other North American colonies. In an age of competing empires and international war, aggressive entrepreneurs risked their lives and fortunes in the hope of making a profit. “All the people here are traders,” remarked an observer of seventeenth-century New Amsterdam. Merchants of all levels of wealth and prosperity, joined by investors of many different occupations, captured the city’s commercial energy. Indeed, the dream of financial success encouraged Europeans of varied ethnicities and religions to sail to Manhattan where they interacted with each other and encountered Africans, both enslaved and free, and Native Americans. Commerce thus created a multicultural, dynamic, progressive city that was a model for New England and Chesapeake colonies and became the foundation for one of the world’s most spectacular cities. There is no better way to understand and experience that energy than by examining the stories of its first inhabitants: indeed, the stories of the world’s first New Yorkers. 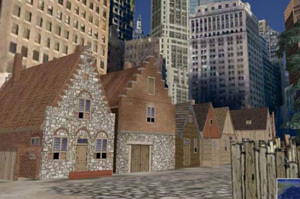 NAHC has created an extraordinarily detailed picture of the history of New Amsterdam by amassing a digital collection of history, images and documents, all supported by a virtual recreation of New Amsterdam as it would have appeared nearly 400 years ago. The following three stories draw from that collection, showing the incredible riches of New Amsterdam and the depth of the NAHC collection.